In a large dutch oven combine the potatoes, oil, and duck fat (if using). Cook over high heat, without stirring, until the oil has reached a rolling boil, about 5 minutes. Continue to cook, without stirring, until the potatoes are limp but exteriors are beginning to firm, about 15 minutes. Using tongs, stir potatoes, gently scraping up any that stick to the bottom of the pan, and continue to cook, stirring occasionally, until the potatoes are golden and crisp, about 5-10 minutes longer. Transfer fries to a paper towel lined paper bag and season with salt. Serve immediately. Enjoy! You are right! 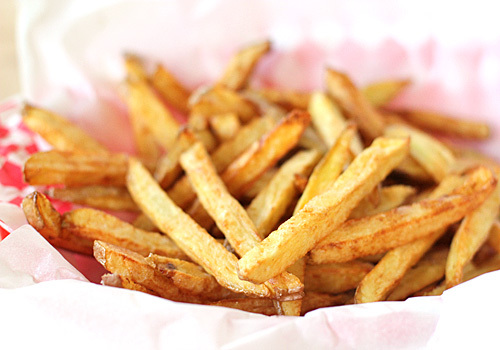 These are the easiest and tastiest homemade fries. The duck fat sounds intriguing.